Raised bed vegetable gardening is the best way to grow. Learn why. For me, raised bed vegetable gardening is the best way to garden. When spring approaches, gardeners across the country are starting seeds and eagerly preparing for the upcoming season. For those considering a new garden, a great way to start is with raised beds. They are attractive, highly productive and will make the whole gardening experience easy and enjoyable. A raised bed is simply an above ground plot or box filled with good composted soil to plant vegetables, fruits and flowers in. They are easy to build and maintain, but like a potato chip, one is not enough. I started my garden﻿ about 25 years ago with three 4 x 12 foot beds. Over the years I have expanded to 60 raised beds and will probably add a couple more this year! There are numerous benefits to raised bed vegetable gardening, especially for beginners. Because the beds are above ground, they will thaw much quicker in the spring and allow you to get a head start on the planting season. They are also easy to care for because with a new bed, you have the chance to fill it with clean weed free soil. Lay some organic black plastic mulch on top of your bed before you plant and you’ll get the double benefit of very warm soil (your cucumbers, melons and tomatoes will love this!) and those pesky weeds will be smothered for the entire season. This is essential in any garden. Raised beds don’t have a drainage problem. Beds should only be four feet wide which means you will never have to step into the box and compact the soil. Loose soil allows for effective drainage, giving tender roots room to grow and expand. So now that you have decided to go ahead with a garden project, let’s talk about the type of raised beds that are available. Wood is excellent because it is inexpensive and pretty easy to work with. At he other end of the spectrum you could simply use bales of straw or hay. Wood is certainly the most common and all of my beds are wood. You will want to use pressure treated lumber for your beds, but it is critical that you buy wood that has been approved for use in vegetable gardens. Wood used to be treated with something called “chromated copper arsenate” and as the name suggests, arsenic could leach into the garden. Today you can purchase pressure treated wood made with “alkaline copper quat” or ACQ lumber which contains no arsenic and is sold under the brand name Preserve. This is what all my boxes are made with. You can use either redwood or cedar, both of which are quite durable and completely natural. They will be a little more expensive, but are also very attractive. Whatever wood you choose, just make sure it is approved for use in the garden. Next, you need to consider what you want to grow, because this will determine the depth of your beds. Obviously, the root structure of vegetables and herbs varies greatly. 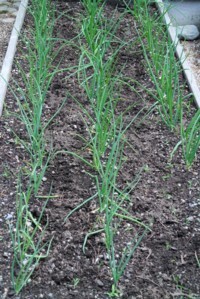 Remember however, that even in a small raised bed vegetable garden, crop rotation is very important. Soil born diseases specific to certain plants can be mitigated through the rotation of crops. To accommodate crop rotation, I prefer to have all my beds at 10 - 12 inches in depth. A bed of parsley one year may be a bed of tomatoes the next. When planning your new garden, something that is frequently overlooked is the spacing between the beds. If you are going to lay the beds on top of a lawn, don’t forget that you will still need to cut that lawn. If your mower doesn't fit between the raised beds, you’re going to have a devil of a time cutting the grass with a pair of scissors! Think about all the equipment that you may use in the garden when determining the proper width of the rows, such as wheelbarrows and garden carts. Here are a couple of more hints that will save some future aggravations. Before installing your new beds, lay a section of ground cloth underneath. This will take care of any weeds that may try to muscle their way into the bed. Also, put down a wire mesh. Moles, voles, chipmunks and the like are very efficient at tunneling from below and can cause a lot of damage when coming up for daily snacks. 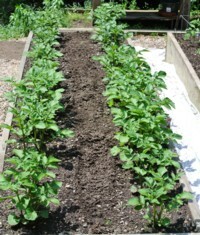 How do you maintain wonderful, rich soil in your raised bed vegetable garden? Compost can be used as mulch to keep weeds out of closely spaced crops like carrots and radishes. At the beginning of each gardening season, add in 3 or 4 inches of rich compost. Humic Acid and trace minerals are also highly recommended for delicious, nutritious vegetables and fruits. I could go on and on about the joys of raised bed vegetable gardening, and every year I discover something new. As a matter of fact, the older I get the more I like my raised beds. A bed that is 12 inches high makes bending down that much easier on the old back! You are about to embark on a wonderful journey. Becoming a “dirt person” is really fun and we welcome you into the club. Now get dirty and get growing!